Anyway, to get back to TLI and life interests: a lot of people think that these products are more or less a black box where you have nothing to go on besides management projections and basic life expectancy information from the latest CDC tables. While this is true when the portfolio is assembled you get more and more information when the portfolio ages and you can compare realized maturities with expected maturities. If the face value of maturities runs consistently below the expected number it’s theoretically possible that it’s just bad luck and negative variance, but a more likely explanation is that the health of the insured group is better than expected and that the real life expectancy is higher that the estimated LE. I have created an overview of the historical changes in the TLI portfolio in the table below and highlighted the most important rows. 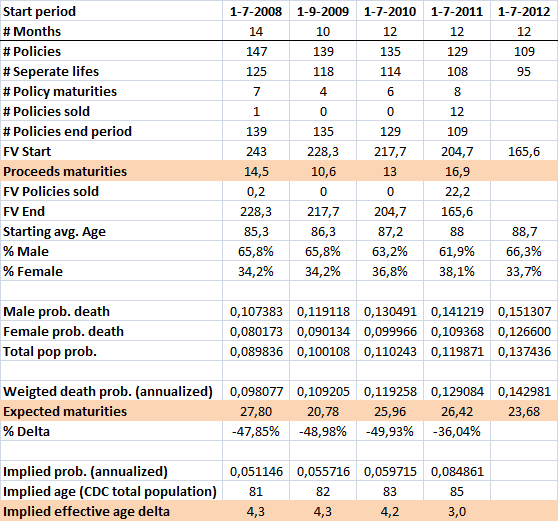 The first highlighted row shows how much money the fund collected from maturities while the second highlighted row shows how much you would have expected based on the average age of the insured group at the start of that year and the death probabilities for that age group as found in the CDC tables (using simple linear interpolation between probabilities if the age is not a round number). The numbers are not perfect because not all financial years have twelve months (made some simplistic adjustments for this as well) and policy sales also distort the picture (no adjustment for this). There also seems to be some errors in the older annual reports. In 2008 one life policy was sold for $550K, but based on the reported face value of the policies at the start of the year and the number of maturities I get a face value of just 200K, and that obviously doesn’t make sense. The reported ending face value of the portfolio at the end of 2008 is reported as 243M which seems to be a copy and past error from the report from the previous year. It can’t remain constant if you have maturities in between. The numbers below aren’t perfect. As is visible the amount of policy maturities have been running significantly below what would have been expected based on the CDC life tables. There could be bad luck in the equation here, but it seems quite unlikely to me that that is the full explanation. Guess the statistics nerd could figure out what the odds are of running this much below expected value, but I don’t think it can be a high number. Humans (I’m part of that group!) are however in a lot of cases pretty bad at estimating probabilities, so I probably should try to do the math. I’m hoping I have a reader that loves to solve these kinds of problems ;). What my assumption would be is that while the insured group now has an average age of 89 their effective age is probably roughly three years lower. It’s not quite the same scenario though: what you would expect is that when the portfolio ages the effective age converges to the actual age. The results also seem to hint in this direction. The reason for this phenomenon is that the effect of a possible negative selection bias diminishes in time. For example: lets say we have a population of 100 people that includes 10 people that have a life expectancy of 100 years at birth while the rest of the population has a 80 year LE. If you somehow manage to only buy the life insurance policies on this high LE group you make a massive mistake at earlier ages. But if you would do this when the average age of the population is 100 it could be that you have 5 people remaining that originally had a 100 year LE while maybe just one guy made it that originally had a 80 year LE. Now your sample is not that skewed anymore compared to the total population. This is obviously a bit theoretical and simplistic, but hopefully I managed to communicate the idea. I have made two changes to the original valuation model: one minor, and one major. The minor change is to assume that an increasingly bigger part of the portfolio is going to contain females. This is because females have a higher life expectancy than males. In the table above you also see that the percentage of male lives in the portfolio is gradually dropping every year with the exception of 2012. This year the fund got a bit lucky with an equal number of male and female deaths. I’am assuming that every year the amount of male lives drops with 1.30 percentage points, in line with the trend between 2008 and 2011. The bigger change is that the average age of the portfolio does not go up with one year every year. At first sight this seemed like a reasonable assumption, but this is not the case because not all persons in the portfolio have the same age. When the portfolio was assembled it contained policies on persons between the age of 78 and 92. What happens is that older persons have a higher probability of dying, slowing down the increase of the average age. This is also visible in the table above: you see that the average age has increased 3.4 years the last 4 years: the average age is going up 0.85 years/year. I have created an updated Excel sheet where it is possible to change the variables discussed above. You can also change the discount rate to either figure out what the present value of TLI is today, or what IRR you can expect based on various share prices (download here). The screenshot above (click on it for the full size version) shows that you should expect a 9% IRR if you think that the effective age of the insured group is three years lower than the actual average age. I think this is a pessimistic case because even if this adjustment is initially right it should shrink every year due to the earlier explained concept. One of the reasons I try to buy investments at a large discount to my estimated fair value is to protect myself from mistakes in my own valuation. In the best case I’m completely right and make a lot of money, and if I’m not right it’s hopefully still undervalued. I think this is the case with TLI. Based on the historical maturities I think the effective age needs to be lowered significantly more than the -0.8 year adjustment used in the initial valuation, but I’am also fairly sure that the -3.0 adjustment is too pessimistic. What this implies is roughly a 10%+ expected return that is not correlated with the market. Still pretty awesome in today’s interest environment if you ask me. Wrt to possible flaws in your investment process, I believe you should not be too harsh on yourself. Don’t you think that opportunity costs should be considered as well before investing? Demanding from yourself that you have to know everything you can know, is very high demand. And very costly because it is time-consuming or because you miss out on an opportunity due to inaction. As long as you preserve your willingness to admit you are wrong, I think this should safeguard you enough. You make a good point, but it’s obviously not a binary thing. You can’t know everything about a potential investment, but at the same you should know more than nothing. So the big question is where you should sit between those two extremes. I do think that a high frequency of new material insights after making an investment could indicate that it might be worth it to move a bit more towards doing more research. c. 50% of policies have no extension, meaning that all face value is lost if the insured reaches 100 (or 100.3 years according to management in the latest report). Your model assumes 100% probability of death upon age at 100, in which case this binary output would not make a difference. Not sure though how to asses this correctly numerically. What would be your thoughts on this? I don’t think it matters a whole lot because the cash flows that are far away have the lowest amount of value anyway since they are discounted the most. 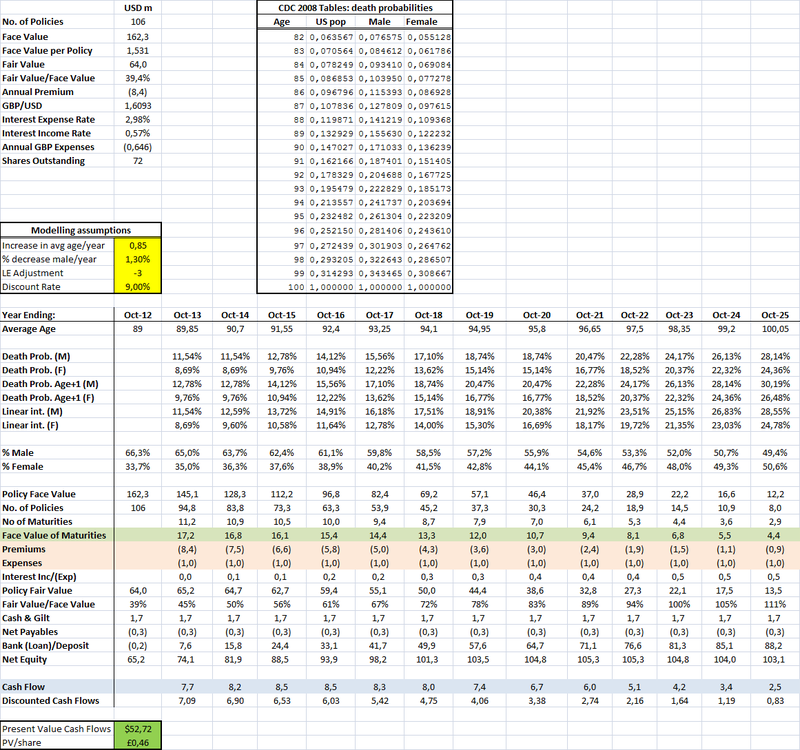 In the spreadsheet shown above you see that the value of the cash flows is minimal the last few years. Also note that this version of the model does not assume that everybody will be dead at age 100. You see in the last column that we start with 12.2 million in face value of policies, that 4.4 million of face value will reach maturity, and the value of the remaining 7.8 million is already simply ignored.